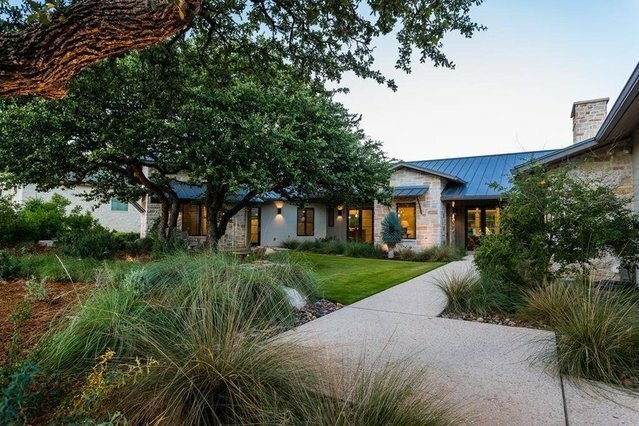 Stunning Contemporary Hill Country home filled with quality, craftsmanship & amazing attention to detail. Gorgeous interior stone walls, stone floors, walls of glass, wood beams, wood interior doors & an ideal setting for entertaining both inside and out. Fabulous outdoor area with stone fireplace, built in grill and outdoor kitchen overlooking pool and golf course. Enjoy SE breezes off the back patio. Chef's kitchen with Thermador commercial 6 burner gas range, island prep area and large pantry.Wet bar with wine fridge. Relaxing master retreat has a spa-like feel. Guest suites each with private baths. One half bath outside for pool area. Over-sized 3 car garage with air-conditioned storage and coated floor is even a must see! Aquasana whole house water filter system. This home has it all.